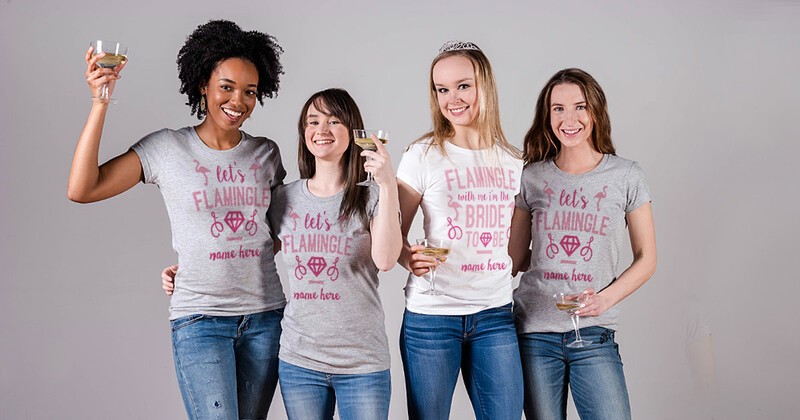 Bridal Party Tees - Everything bridal and bachelorette! So, what did the bride do now? We’ve got her booked for stealing his last name. 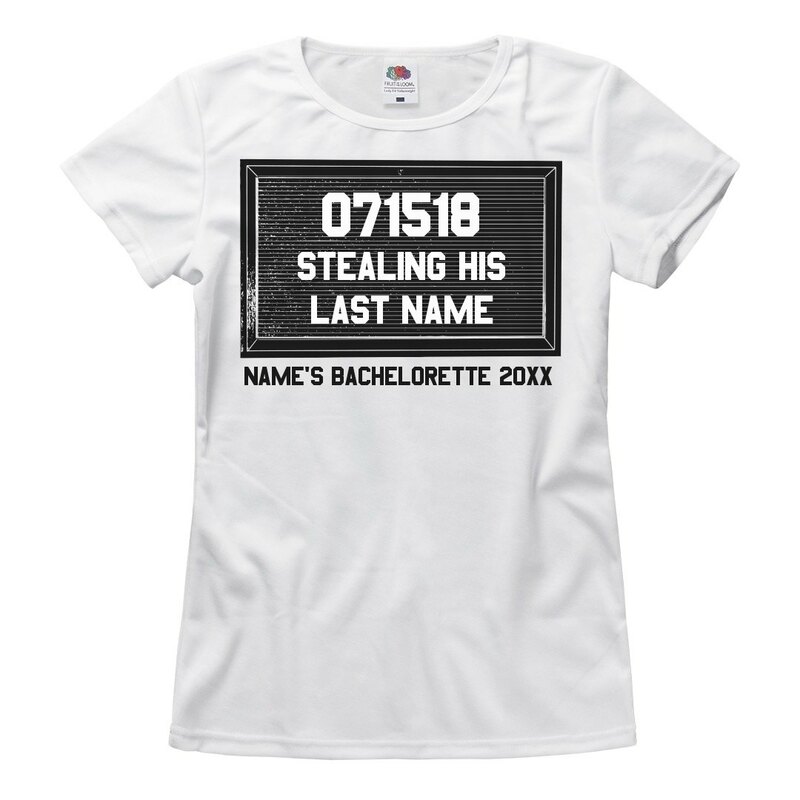 For all of the brides out there that do everything with a little bit of extra flare, we’ve got the perfect matching t-shirts for you and your crew to rock at the bachelorette party: Custom Crime Tees. You’re not just changing you’re last name, you’re stealing his and making it yours. We hope you look good in orange, because that’s a class A wedding crime. Which one of your friend’s is most most likely to get booked for dancing on the bar, or flirting with the bartender? Assign each of your besties a funny lineup tee that sounds most like them. You can even create your own by adding in custom text. 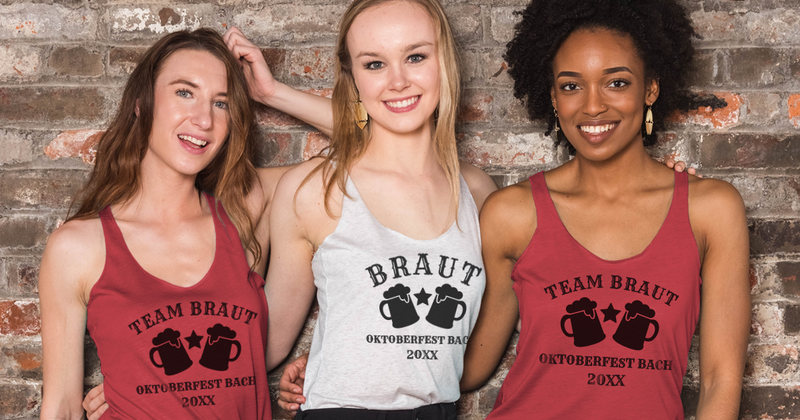 At Bridal Party Tees, we know what it means to throw an awesome bachelorette party, and everyone knows that just about every bach bash starts with custom shirts. Are you thinking that you definitely want matching shirts for you and the ladies? But don’t know where to start? Check out our best sellers to see if that sparks some inspiration. The best part is that you have the ability to make each design you see 100% unique & one of a kind. You can customize anything you see. This means you can add text, art, change colors, and even swap out the shirt/sweatshirt/tank top style! You can even rope in the fiancee by designing his & hers matching t-shirts for the two of you. Mr. and Mrs. Perfect? I think so! They’re the ones who have always been there for you, and they’re the ones who will stand up with you on your big day. They are your I Do Crew. 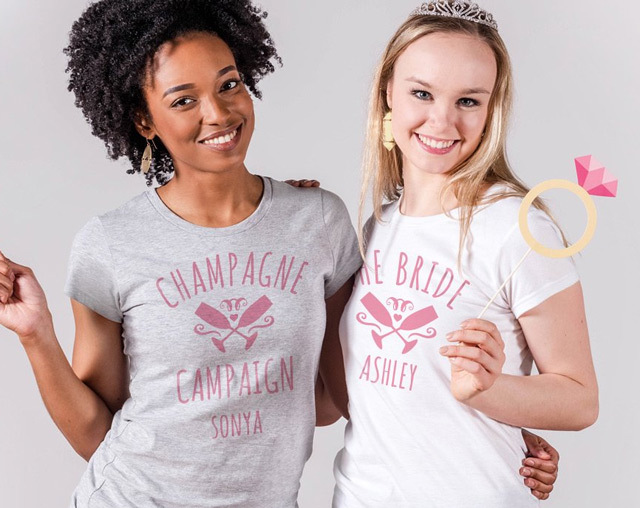 At Bridal Party Tees we know how important your besties are and that’s why we’ve made sure to create something special not only for you, but them, too. We also know all about the hype of an awesome bachelorette party, and the matching tees that go hand in hand. That’s where we come in. 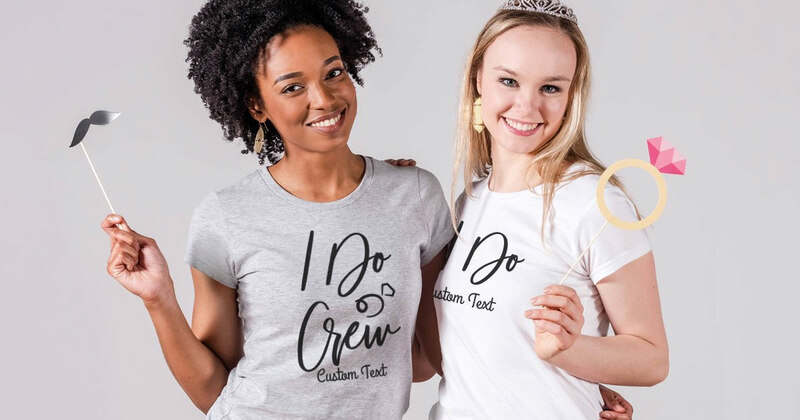 We want you all to look and feel your best while you celebrate, and we think our matching I Do Crew shirts will do just that. Whether you’re planning a pampering night in or a wild night out, it’s never the wrong occasion to match with your favorite ladies. If you’re looking to add even more pizazz, you can easily tweak the look of these tees in our design center. And when we say easily, we really mean it. We probably have the most user friendly design center out of all of the custom t-shirt websites out there. Add custom names, dates, or even inside jokes to create something 100% unique that nobody else will have. That’s what’s so great about customizing your own shirts – you won’t see a bunch of other bachelorette parties rocking the same ones. All of our awesome I Do Crew design templates were created in house by our talented design team. You won’t have any trouble finding one that you love. If anything, you won’t be able to decide which template to start with! Don’t forget that you can transfer any design on to a different item. If you’re looking for a crop top but LOVE a design that’s on a sweatshirt, just use our swap tool in the design center to swiftly make the change. 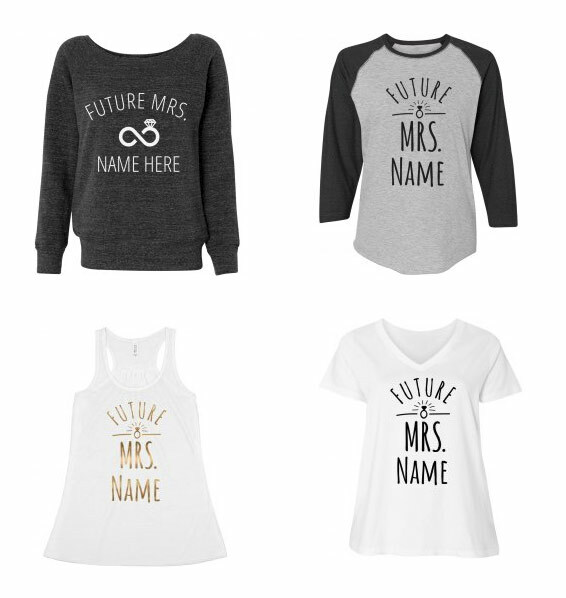 Crop tops, hoodies, crewnecks, tanks, flowies, jackets, flannels, sweatpants, sashes…you name it, we’ve got it! In the end, it’s your I Do Crew that makes your bachelorette party one worth telling the grandkids about (well, most of it anyways). That’s why we believe they deserve something special to wear with you. Show your best pals how much you appreciate them and make sure they’ve got a custom I Do Crew t-shirt to wear for your big bach bash that’s coming up!